In 1972 my dad and I toured Washington D.C. by bicycle. That produced fond memories. 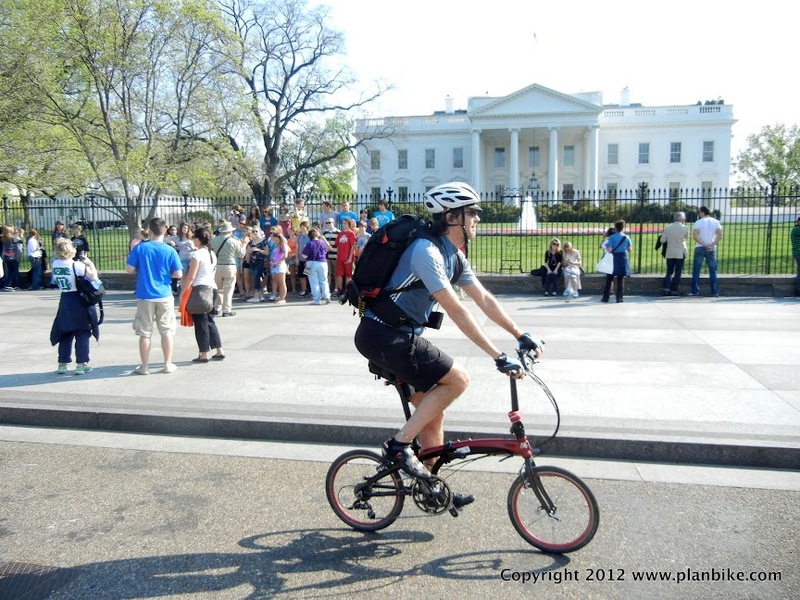 News in recent years from D.C. about Gabe Klein's appointment to DDOT, the resulting new Capital Bikeshare program, and miles of new bike lanes, made we want to cycle D.C. again. 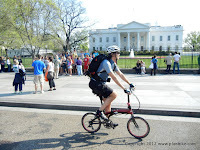 Cycling during the 2012 National Bike Summit in Washington D.C., made for a nice 30 year reunion between my bike and the nation's capital. What follows are a lot of pictures and a few reflections on this experience. There were so many that I've divided them into separate posts. This is the first one. I just call it "getting there". Cycling to D.C. from California might be nice some day when I have more time to spare but since that day has not yet arrived, I had to fly. That said, the whole point was to ride the city when I got there. Where to get a bike? Although Capital Bikeshare is a great program for getting around the city proper, I had longer rides planned. A fitted road bike would be more suited to the task. Although I have rented, and could rent, a proper road bike, I am also tall and oddly proportioned. Most rentals target the average-sized person. I knew from painful experience that I needed a bike that fit really well or I would be laid up with backaches instead of out enjoying my stay. Consequently, I decided to bring my own bike. Nevertheless, if you are in that sweet spot of 5 feet 2 inches to 6 feet 2 inches, chances are there is a rental bike available no matter what quality level you require. Flying with full-size bikes can be an expensive proposition. For the Olympics, United charged me $100 each way. Granted, that was for a 3 foot by 4 foot rolling bike box but it wasn't as heavy as many regular suitcases and other airlines have charged far less or nothing at all for the same case (e.g. Southwest and JetBlue). This time I hoped to avoid such expenditures by bringing my folding bike in a regular suitcase. The folding bike suitcase was large but not so large that it could not to be treated like regular luggage, or so I thought. Unfortunately, I answered honestly when I was asked what was in the suitcase. Once the word "bike" was mentioned, I was kicked out of the normal luggage line and placed with the Australian surfer checking in his surfboard. He got stung for $100. I paid $125 because the ticketing staff suddenly realized that they hadn't been charging the "normal luggage fee" on top of the oversized luggage fee. Despite the fact that my suitcase was not overweight and could easily fit on the normal conveyor belt, I was assured my bike case could not be treated as regular luggage. 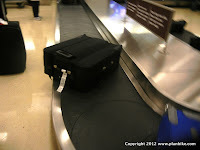 Consequently, it was a bitter irony to see my suitcase come out of the normal conveyor belt when it arrived in D.C., i.e. not the oversized luggage door. My advice: don't fly United with any bike. Other airlines are way more accommodating to bikes. As for folding, make sure the suitcase really is standard size. In my case, that means I have to breakdown my Tern Verge X20 a little more than I hoped. For serious compactness, the Brompton seems good. However, no folding yet matches my Tern for serious long rides. 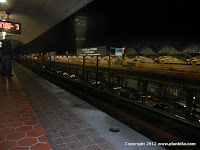 Thanks to the newish Ronald Reagan Washington Airport, which is surprisingly central and well-connected to D.C.s metro, getting to my hotel downtown took virtually the same amount of time as a cab at rush hour. The D.C. metro was great. Maybe I was just lucky but I never waited long for a train, not even when I got lost and had to reverse direction. It was also relatively clean and the stations look pretty cool. The first thing I saw as I exited my metro station was a separated bike lane: a welcoming sign. Unfortunately, I couldn't ride it just yet. My bike was packed up in its suitcase. Note to folding bike makers: build a bike case that you can tow behind your bike so you can extract the bike and ride immediately upon arrival. I've seen a few of these but you have to assemble the wheels. The ideal would be something done in seconds at the airport or metro station. Call United, complain. Get a supervisor, get your $100 back. Not at all cool for them to be charging people based on the contents of their standard-sized luggage. Agreed with KB. If your luggage met the weight and dimensional requirements, there is no cause for the "bike" fee. I've flown with a folder inside of the Airporter Mini suitcase, which meets the dimensional requirements of most airlines, and never been charged. One agent inquired what my luggage contained, and I answered "bike PARTS and clothes." Sufficiently accurate without being totally forthcoming. I posted a link to this post over on bikeforums -- others have pointed out that this charge is against current UA policy. Get your $$! I hope Tern makes a cool case. I have a Bike Friday case and a Dahon -- the soft-sided Dahon is rather poor imo. Both do need disassembly of the bike to fit, though. Regardless of airline, the TSA (or regional equivalent) *always* opens my bike case. As it happens, United just emailed me a "credit certificate" for $100. I suspect I have you to thank since the corps are all datamining the social networks. Regardless, I appreciate the attention to this. I knew the Airporter was borderline. I may have to go for the mini. I believe that the person at the counter is wrong. It's a good practice to print out the airline's regulations before flying with them. We usually take the extra step of e-mailing customer service to verify the policy. Late to the party here, but if others are planning to come to DC, and ride the metro, it is important to note that you can not take a full size bike on the metro during rush hour. You can take a folding bike in its bag at all times, out of its bag outside of rush hour (and only the busier stations downtown actually enforce the bag rule consistently. Update: folding bikes need no longer be bagged at all on Metrorail.